I love to indulge in bread, but as you know it’s not good for the waistline and for some reason when I have bread, I tend to want more and more! I think the carbs have me craving it! So whats a girl to do when this happens? 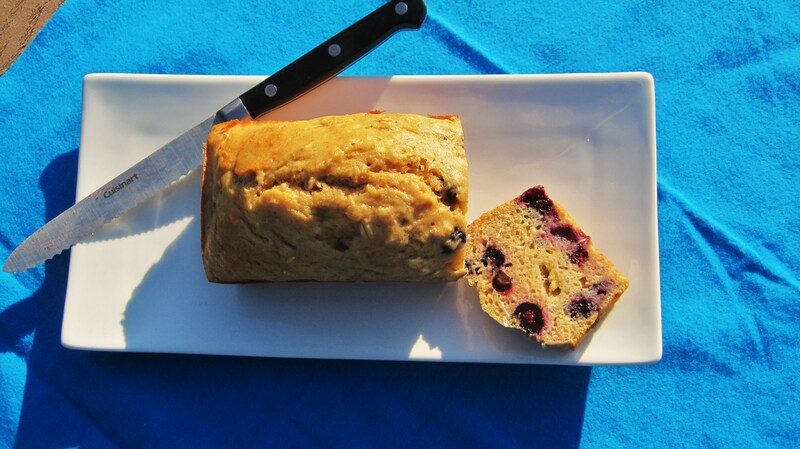 She makes a healthy bread that is completely guilt free! Yes guilt free!! As I was debating what to make, I started to rummage through my cupboards and I saw 3 lonely bananas that were starting to over ripe, uh oh! I can’t waste them! 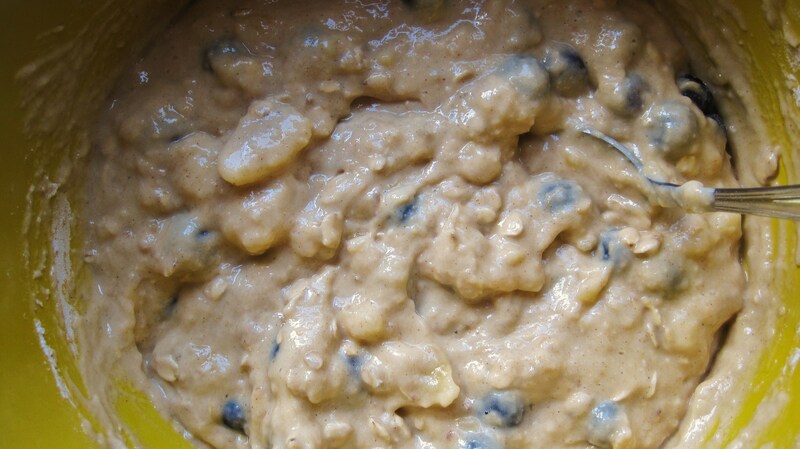 So out came the mixing bowl, blueberries and oatmeal! I am putting together a bread that is healthy, low in sugar and something that is sweet enough to satisfy my bread and sweet cravings! 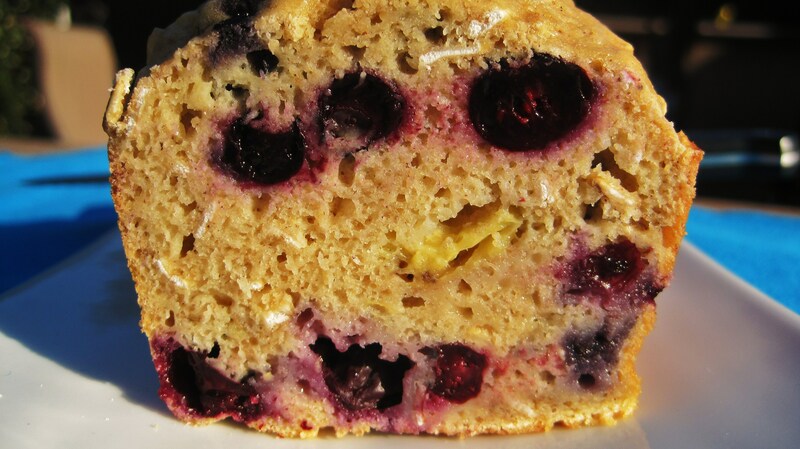 Out came this beautiful Banana Blueberry Quick Bread! First I mash up the banana’s! There so easy to mash when there over rip! I just used a spoon! 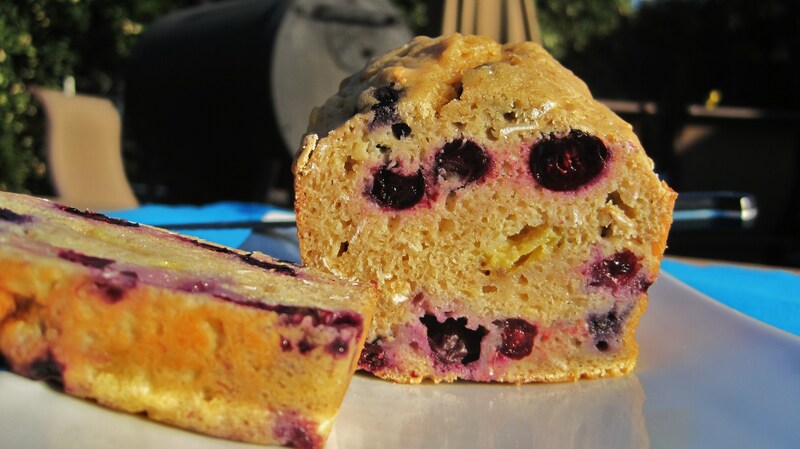 Threw in all the other goodies and folded in the blueberries! I made three small mini loaf pans worth. One for home, one for work and one goes in the freezer, encase I crave more sweet, moist bread! Mix together dry ingredients until well combined. In a separate bowl, mix eggs, applesauce, and bananas. 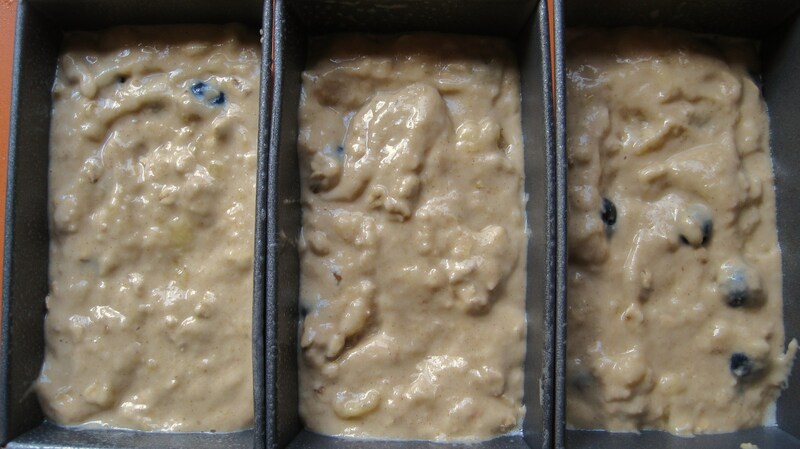 Stir banana mixture into flour mixture, and then add blueberries. Stir carefully (the blueberries crush easily). Bread is done when a toothpick comes out clean. Note the banana may stickto the toothpick! Question: What are your plans for Thanksgiving? Are you making dinner? It’s just my Husband and I this year, so I am not sure what to make. He requested my Garlic Mashed Potatoes, but other then that, I am not sure what to make. I finished my blog, but then decided to bake, so I thought I would share with you my tasty flop before I sent my post to you!! 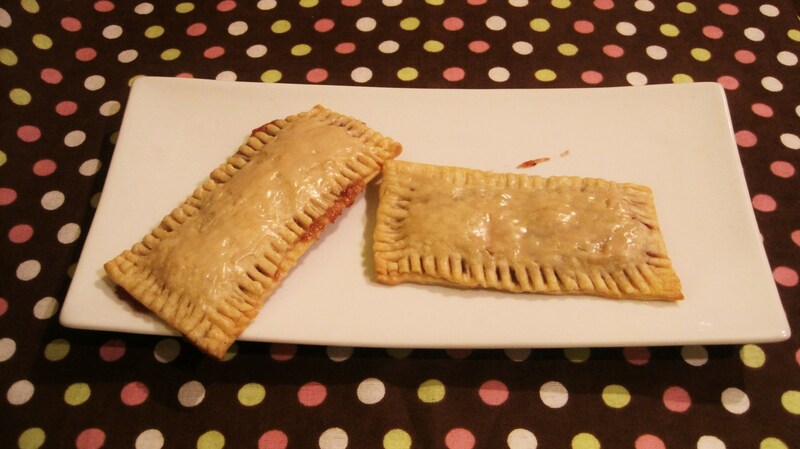 My Husband wanted Poptarts in his lunch, but being the foodie that I am, I said let me make them for you. He was hesitant, but said ok, so I took my pastry shell that I had left over from my Mini Apple Pies and use that to make the crust to my Poptart. I rolled them out into 10 uneven (not on purpose) pieces. Using the Silpat is great, nothing sticks to it. I added a little flour and just rolled it out! I had a little left over so I made a mini Poptart, which I ate before I took the final picture. It was good!!! 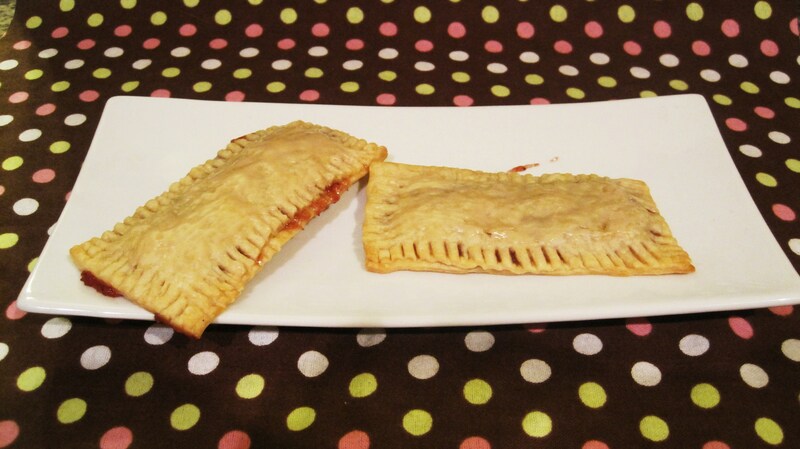 I filled 5 Poptart pastries with 2 tsp. of Organic Strawberry Jam from Trader Joe’s. 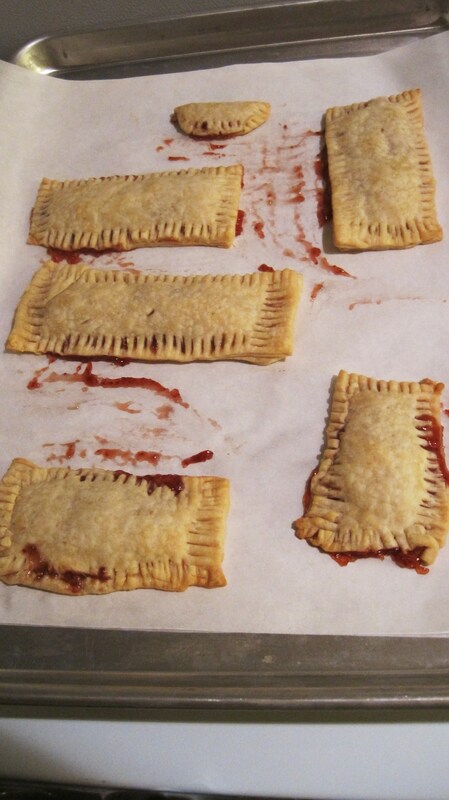 Then I topped each piece with the other pastry, making 5 Poptarts and one baby! Out of the oven it came! Jam exploded everywhere, so I kind of wiped it off with my finger and ate it, it was good! Don’t judge me, you would of done the same!! They don’t look so pretty, but hey I never claimed to be a baker, just a food obsessed person who will try to bake anything that you ask! Or that I crave, if I’m to lazy to go to the store and buy it! Did I tell you that these do taste good? Flop your wondering? In my head it’s the calories and presentation, there not to cute! But way better tasting then the original Poptarts! Oh and I made a vanilla glaze to go over the top! A Poptart wouldn’t be the same with out the glaze. Next time, I will take my time and try to make them more pretty and more even in size. I made these in under 10 minutes and baked them in 15 minutes. It’s late at night and How I Met Your Mother is coming on and so I rushed a bit! 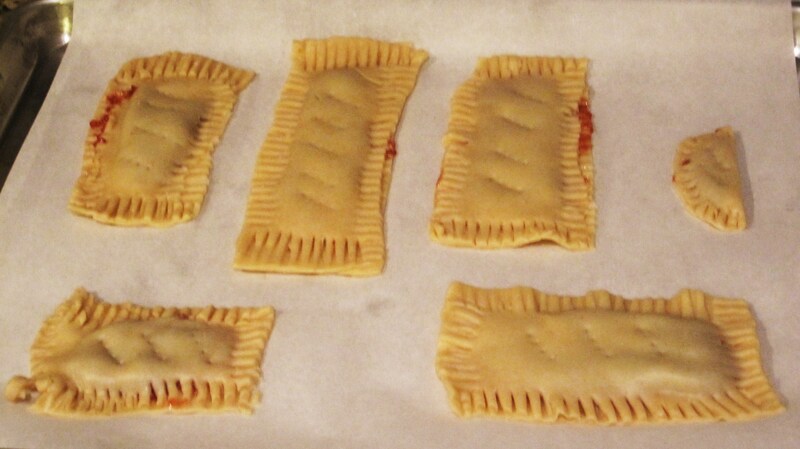 Next time I want to get 8 Poptarts out of a pastry shell, even if there tiny! You know I’m trying to make things healthier, or in small batches, so next time this for sure will be smaller. But then again, these aren’t for me, there for Hubby’s lunch. I think he’ll be pleased! Top 5 pieces of your pastry with 2 tsp. 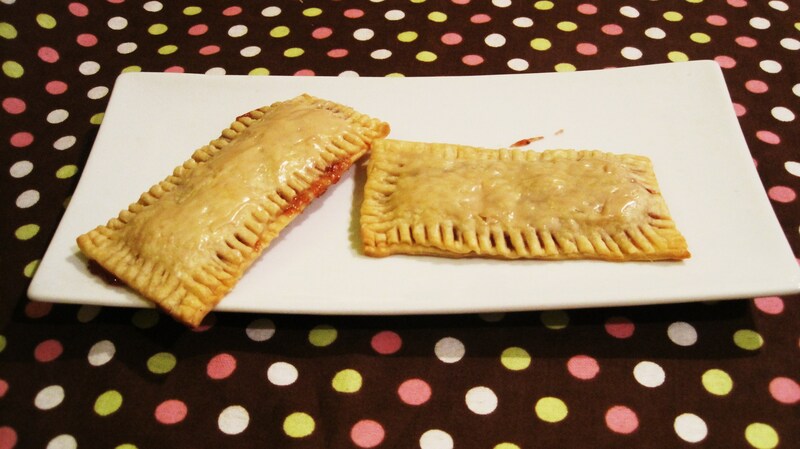 of jam and then top with the other piece of pastry, making 5 Poptarts. 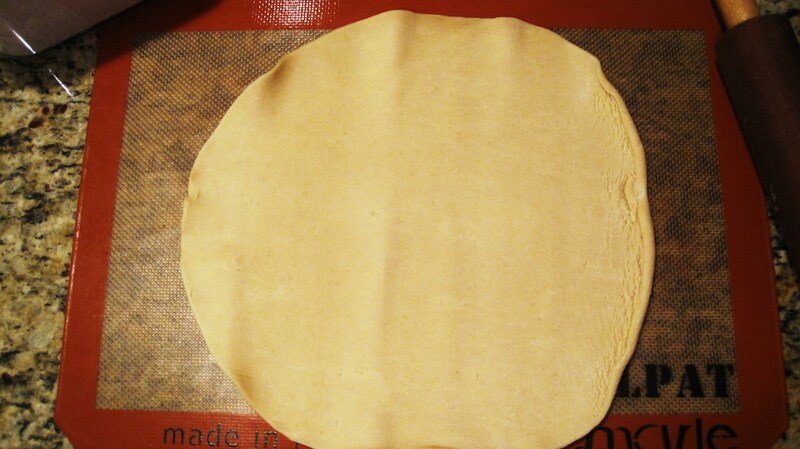 With a fork, make fluted edges all the way around the pastry to seal it. Poke 4 little hole with the fork on top, so steam escapes, or it will explode kind of like mine. My holes weren’t deep enough. Bake in oven for 12 – 15 minutes, they’ll be a light brown on the bottom. Set out to cool. While cooling make your vanilla glaze. In a small bowl, add your powdered sugar and vanilla extract, mix together until the consistency you like. If it’s to thick add a pinch of milk (I add about 1/4 tsp. of milk). 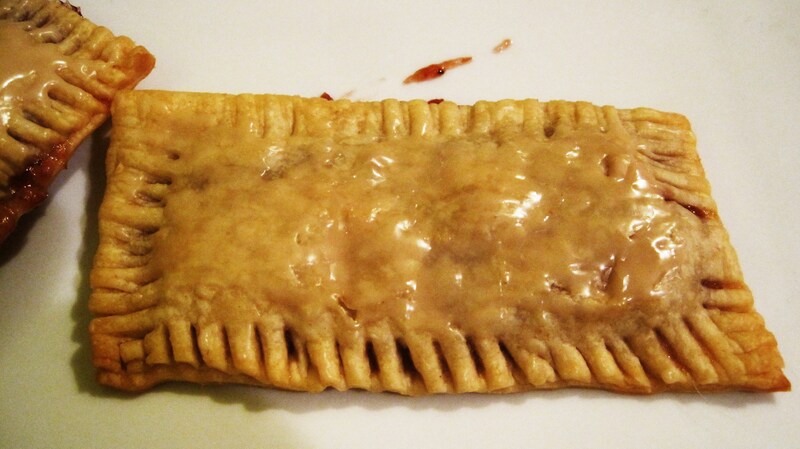 With a pastry brush, top your Poptart with your Vanilla Glaze. I looked up a Strawberry Poptart stats to compare and there pretty close to the same, however mine has less sugar and less carbs! That’s good, but more fat! 🙁 But this was just a fun thing to do! I’m happy with them and they do taste WAY better then a regular Poptart!! They taste, light and fresh!! I’ll definitely make these again! If you make these, let me know how yours turned out! Have a great day!!! 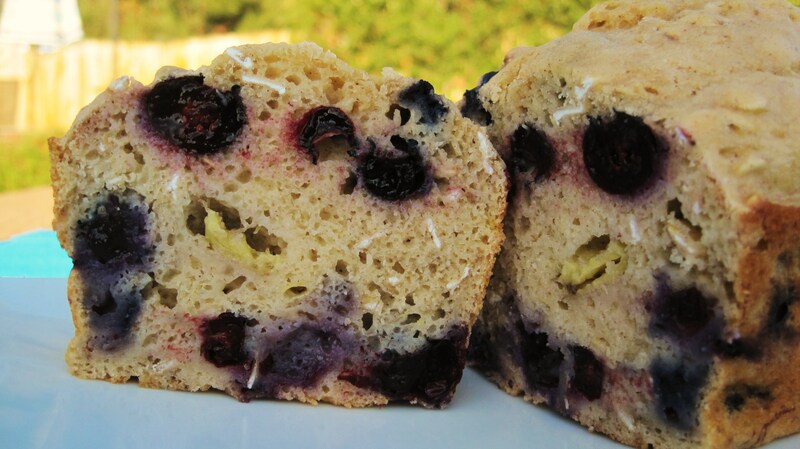 All those big berries in there has really won me over, I would love a slice. Yes, you have opened the door to many varieties of this bread in the future. Also, I think your pop tarts look delicious-lucky hubby to be the recipient. I have had my bout with the oozing jam, but it sure doesn’t spoil the taste. Thanks for sharing. Stuffed Turkey Breast Sounds good! I just hope my Husband doesn’t bring home a turkey from work. Every year he gets a 11or morepound turkey and I have to cook it. To much work and to much time for just the two of us. I know I’ll probably get stuck making the whole thing. However Turkey leftovers will be good! I have to try your bread recipe. It sounds delicious!